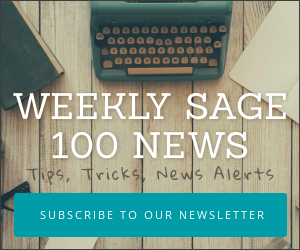 According to a post today on the company’s web site, MIS Group (Management Information Services) – Sage North America’s 2007 and 2008 Business Partner of The Year – is ceasing all business operations. Callers to the company’s phone number are greeted with an announcement stating that “the company regrets it’s no longer able to conduct ongoing business operations” and refers callers to the MIS Group web site and encourages customers to call Sage support at 866-996-7243. 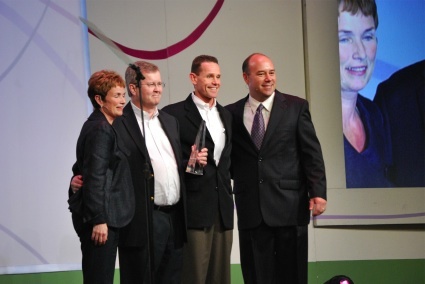 This is a rather unexpected and surprising announcement from a consulting firm that had posted the highest total sales of Sage services and products from October 1, 2007 to September 30, 2008 and was the Sage Business Partner of The Year for both 2007 and 2008. With their main office in Dallas, MIS Group also had offices in Denver, Houston and Phoenix. MIS Group used to resell several Sage products, including: Sage MAS 90 ERP, Sage MAS 200 ERP (including the Sage MAS Extended Enterprise Suite), Sage MAS 500 ERP, Sage Timberline Office, Sage Master Builder, Sage SalesLogix, SageCRM, Sage Abra HRMS, Sage FAS Fixed Assets, and Sage TimeSheet. Here’s the announcement from the company’s web site that “effective July 6, 2009 it will cease all business operations“. This action appears unprecedented in North America – especially from such an award winning, and by all appearances successful, consulting firm. Their company had been formed in part by a series of mergers with several well regarded Sage Business Partners . Their product offerings included Sage Timberline Office , SageCRM, Sage MAS 90 and MAS 200, Sage Master Builder, Sage SalesLogix, Sage MAS 500 and other products. Their web site also claimed they were one of the largest North America Dell VARS. 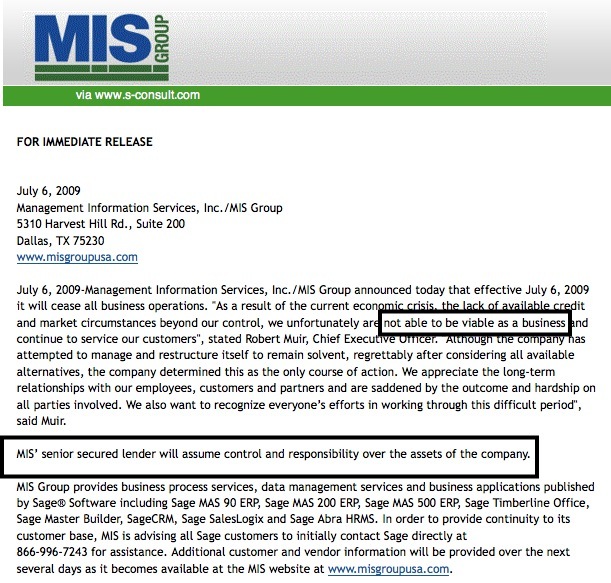 The web announcement (posted below) appears to signify that creditors have taken control of the MIS Group. It is unknown what arrangements are in place for their client base or how those customers are obtaining support. Several inquiries to Sage have produced replies that indicate that Sage is still formulating a plan to address affected customers. We’d been tipped that this was in the works over the weekend. At least one person Tweeted the rumor over the July 4th holiday. However the official word did not arrive until July 6th when the official MIS Group Web Site posted a press release which announced the following. July 6, 2009-Management Information Services, Inc./MIS Group announced today that effective July 6, 2009 it will cease all business operations. “As a result of the current economic crisis, the lack of available credit and market circumstances beyond our control, we unfortunately are not able to be viable as a business and continue to service our customers”, stated Robert Muir, Chief Executive Officer. “Although the company has attempted to manage and restructure itself to remain solvent, regrettably after considering all available alternatives, the company determined this as the only course of action. We appreciate the long-term relationships with our employees, customers and partners and are saddened by the outcome and hardship on all parties involved. We also want to recognize everyone’s efforts in working through this difficult period”, said Muir. MIS’ senior secured lender will assume control and responsibility over the assets of the company. 866-996-7243 for assistance. Additional customer and vendor information will be provided over the next several days as it becomes available at the MIS website at www.misgroupusa.com. MIS Group is a technology services organization that provides a unique blend of business process services, business software applications and data management services, giving you a single source for your technology needs. Based in Dallas, Texas, with offices in Houston, Denver, and Phoenix, MIS Group serves customers throughout the central and western United States as well as Canada and Mexico.